Arch. Roberto Baciocchi is the founder of Baciocchi & Associati, an architectural studio internationally known with headquarters in Arezzo (Italy), where he works with six associate partners and a total of 60 technicians and designers. He is particularly known for the realizations of commercial spaces worldwide. Since the beginning his specific interest has lead him to the world of art and fashion, where he managed to innovate the concept of modern luxury, interpreting the numerous brands’ philosophy that he has represented in minimal architectural lines concerning the shapes and traditionally regarding its materials and colors. He dedicates his activities to commercial, residential and industrial projects and to his design passion that expresses into the creation of design objects. He is the designer of all the commercial and corporate spaces for all Prada Group brands (Prada, Miu Miu, Church’s and Car Shoe) with whom he collaborates since 1982. He has also conceived the Prada Concept giving it the display imagine and its classic pale green tone that, even enriched and modernized, identify this brand all over the world. He has defined Miu Miu Store Concept since its first realization in 1988, imprinting the minimal imagine that has then influenced all the design applied to Retail during the next decades. Up to today he is still continuing the close collaboration with the Group for whom he has been working, during the past years, to the new imagines with the new realizations of the boutique of Prada in Rue Faubourg St. Honoré, Paris, Miu Miu in Via Sant’Andrea, Milan and Prada Man in Via Montenapoleone, Milan. Upholstered armchair characterized by soft and sophisticated shape suitable for community, residential and hotels environments as well. The inner seat is made of variable density padding to always guarantee an high level of comfort. Available with four fixed legs frame or with four races swivel base, varnished dark brown, Gold or nickel-plated finish. Seat, back and armrests can be upholstered in fabric, leather with a vintage effect or by using the precious and researched Rubelli velvet. Thanks to its compact dimensions, the design of the armrests and the possibility of customization, the final aesthetical effect is always of particular refinement if well combined to the various and available upholsteries. The seat without armrests is a valid alternative to the original version. 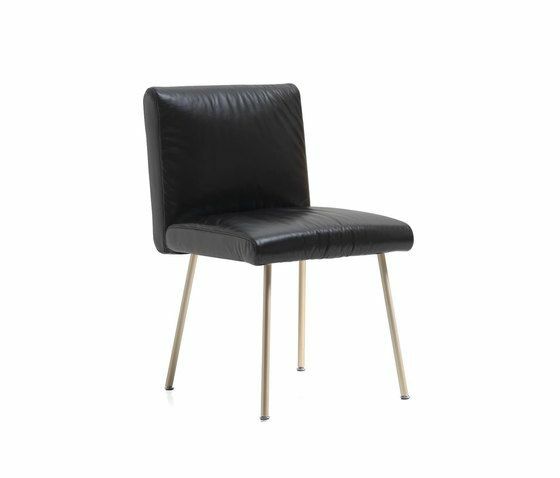 The absence of the armrests makes the chair more compact and versatile, for this reason it is particularly suitable for restaurant and environments with limited space. The interesting combination among armchairs with or without armrests and sofas, allows the furnishing of complete spaces.